Ectropion is the turning out of the lower eyelid (eversion), such that the inner surface is exposed. Rarely, it can affect the upper eyelid as well. It is a medical condition which may result because of any weakening of tissue of the lower eyelid. Anti-Cancer (chemotherapy) treatments & drugs such as erlotinib, cetuximab and panitumumab, which block the functioning of the epidermal growth factor receptor (EGFR). Excessive watering / tearing of the eye (Epiphora) – The eversion of the eylid margin causes tears to overflow on to the face. In addition, The affected eye makes more tears in order to protect the cornea from drying and hence, the eyes start watering continuously. Dry, painful eyes – Inner lining of the eyelid becomes sore and dry, causing eye irritation, grittiness and pain. The part of the eyelid situated next to the nose everts the earliest and the most (medial ectropion). Tears may roll off the drooping part of the eyelid. 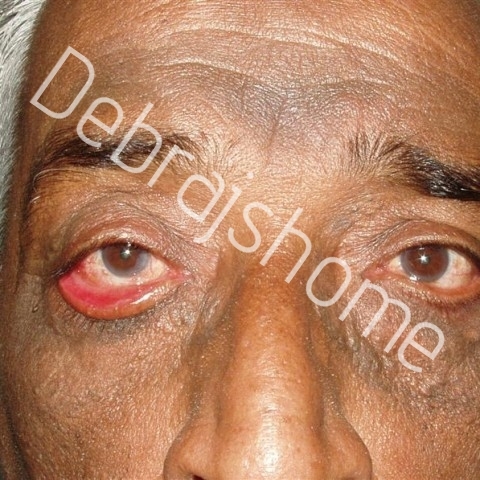 Damaged cornea – In case of Ectropion, the eyelid malposition leads to failure in complete closure of the eyes. Cornea gets damaged since it is not protected completely, resulting in the development of a corneal ulcer, a vision & sight threatening condition. Only one of the eyes may be affected. Although, in common age-related involutional Ectropion, there may often be bilateral involvement (both eyes). Physical examination of the eyelids and eyes confirm the diagnosis. A lubricant (artificial tears) may relieve dryness and help in lubrication of cornea. Corrective surgery (Plastic Reconstructive Ectropion Surgery) is a treatment for tightening the skin and muscles around the eyelid. In severe cases, more extensive plastic surgery may be required.